Model-View-Controller web applications may be difficult to pentest, since they strongly depend -for almost any aspect- on the technology they are developed and deployed with. 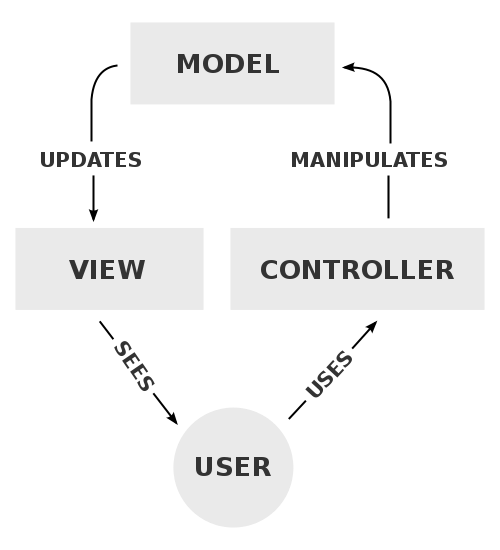 From the attacker perspective, interacting with a complex multi-layer web application means dealing with very technology-dependent configuration files and implementations; on the contrary, classic web applications (such as WebForms) present a more traditional and simple structure, where looking interesting data and handlers may be easier. In this post we will describe a series of steps, based on real world experience, to exploit a Path Traversal vulnerability and reach a full disclosure of source code, by downloading and decompiling DLLs of a Model-View-Controller application within .Net MVC architecture and Razor as the View Engine. A Path Traversal vulnerability is present on the target application, and the standard web.config file can be downloaded. 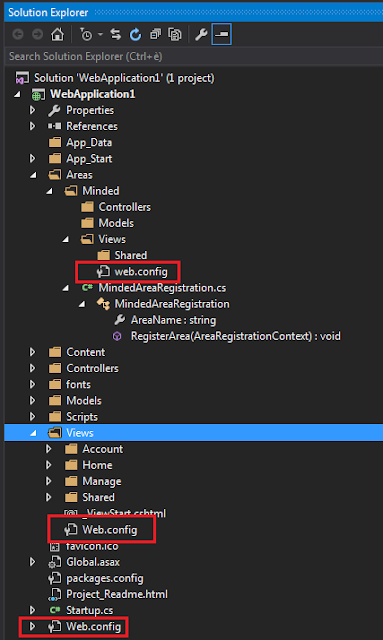 As any .Net application, MVC applications have a web.config file, where "assemblyIdentity" XML tags identifies every binary file the application uses. Note: this file contains passwords! In addition, .Net MVC applications are structured to define other web.config files, having the aim to include any declaration for specific namespaces for each set of viewpages, relieving developers to declare “@using” namespaces in every file. Note: the /Views folder is part of the Razor View Engine configuration. If the application uses Areas, consider that each Area with graphical interface capabilities could have a dedicated ./Views folder containing a Web.config file for further specific namespaces. Any /Views and <area-name>/Views directory may contain a web.config file, that can be downloaded via the former Path Traversal. Web.config files may refer to other classes via the "type=" attribute, as well as new namespaces. From a very shallow analysis, the declaration of a custom namespace (since other namespaces are defaults) suggests that a DLL called "WebApplication1" is present in the /bin directory. Therefore, the DLL file can be decompiled with tools like .NET Reflector, in order to obtain the source code of the related part of the web application, and additional information to advance in the attack. Decompiling the main DLL shows several details about the internal structure of the application, and its dependencies and modules. The namespace WebApplication1.Areas.Minded corresponds to the namesake area, i.e. 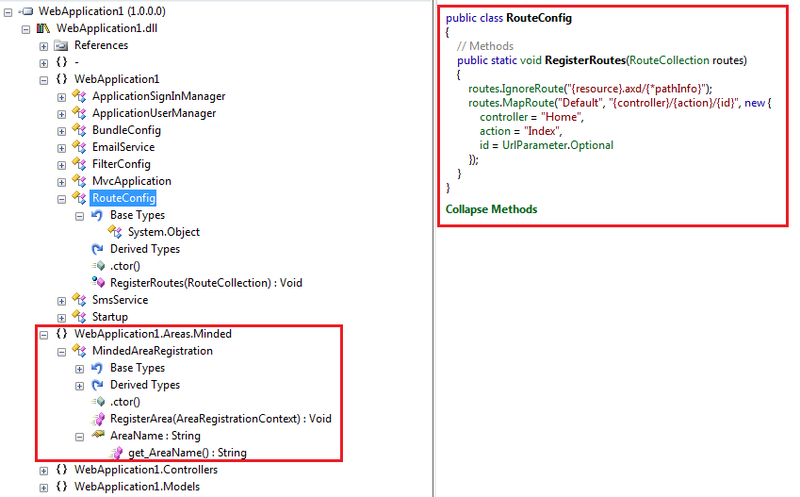 a section of the application which is most likely to be accessed with a path similar to https://example-mvc-application.minded/area-name/. 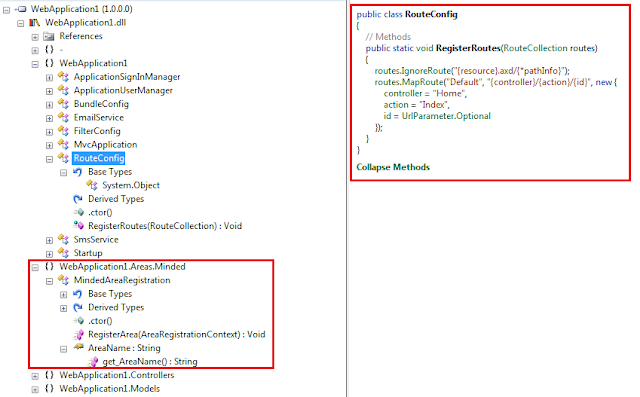 Routeconfig.cs file has been extracted to understand the specific rules the application follows to translate URLs to Controllers (which can be considered as the web handlers of the application). From the definition of an Area, an attacker can infer that other web.config files are present in the application, in guessable/default paths as /area-name/Views/, containing specific configurations that may refer to other DLL files present in the /bin folder. All the web.config files have been downloaded, and they can be inspected for specific references, disclosing details on the /bin directory. The most relevant XML tags, an attacker should look to identify DLLs of a MVC application, are the declarations of namespaces, the inclusion of assembly files, ant any reference to types. For the sake of completeness, it must be said that these steps allow an attacker to initiate a grey-box analysis against the web application. In fact, the /bin folder of the target application itself includes several additional DLLs which are referenced by inner libraries. To understand the gap between the actual /bin folder content and the result of the described technique, the picture shows the real content of the folder, from the internal perspective. Besides, downloaded DLL files can be treated as any other DLL, which means their dependencies can be listed and they can be decompiled, to investigate more deeply.